Charleston is home to rich history, stunning views and unique culture and traditions. Proud residents have kept this southern city in pristine condition for centuries and this popular tour highlights the best attractions and landmarks for first-time and returning visitors alike. The Carriage Tour experience covers three to four miles of the Historical District and is narrated by a city-licensed tour guide with stories and insight to share. With tours departing every 30 minutes from 20 Anson Street, this Charleston experience is sure to fit your schedule. Visitors say there's something magical about seeing the city the same way people did more than 300 years ago. What a wonderful way to see the city and learn about its history! Our tour guide Al was so informative and fun! Thanks for the memories! I would like the guide to move a little SLOWER so that the group can actually study and understand all that is being said. I was also under the impression that we were going to tour the area around Battery of historic homes ....until I found out the tour is actually determined by a ping pongball a la state lottery style as to where the carriage will actually go. I was also promised 5 off on the purchase of my tickets thought Viator....it did not accept the discount code I entered and immediately went to the paid page with the full price. That was a little disappointing but not a deal breaker. Overall it was a nice adventure. Definitely a must do while in Charleston. This carriage tour was amazing. Try to get Al and Jake (the horse) as your guides. Al added lots of humor to his narration. We loved Blake as our guide. He was funny and knowledgeable about the town's history. His horse Trevor aka Tater Tot was beautiful and so well behaved. We would so do it again next time we are in Charleston. A great family or couple outing. even my 77 year old mother loved it. This was a fun tour. We were entertained by Gary the horse and his driver. Nice ride through the city. Glad to hear the horses are rescued from farm work. This was a great choice for my wife and me. We had a wonderful guide who happened to be a university history professor during the school year. She provided tremendous insight into the historical sights. Our particular tour took us around many churches. You won't know which circuit you are on, however, until you actually start since the city regulates how many tours go in each section of the city. No matter, you're still going to gave a great time! Wonderful tour of Charleston. Our guide was extremely knowledgable and entertaining. Our horse was fairly new to carriage tours and had gotten spooked on one occasion which was a little scary at the moment. While the tour itself was wonderful, please remember that you do not have a choice of what to see. The city directs all carriages. While I had been to Charleston previously, I was hoping that my guests would enjoy a tour of the battery, however, we still had a wonderful time! I think our guide's name was Adam.....he did a great job! My mom was in town for Easter and had never been to Charleston before. This was a great way to show her downtown, all while hearing from our guide the history of the area and how it came to be. Our guide was very knowledgable and made the experience well worth it! I HIGHLY recommend this tour to anyone! 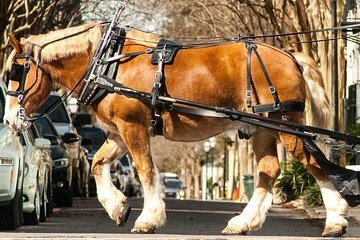 Charleston has a beautiful historic feel about and touring by carriage is great, however due to the number of carriage companies and to keep traffic down, the area is broken up into Zones. You don't know what's in each zone or what zone you'll get when you are booking, it's like a lottery. This is the only drawback and it's a big one. I niavly thought by booking the residential tour you would get to see lots of it, but because of this zone grid, you only get to see about 8 streets...which very well may not be the ones you had hoped to see. This is nothing against the company itself or the guide, both were good....simply the system that needs to be clarified, so people know what to expect.